A collision with an asteroid might have set the planet Mercury whirling oddly in its orbit, a new study suggests. When one body orbits another — say, a moon around a planet or a planet around a star — the orbiting body often spins. Our planet experiences day and night because it spins on its axis, regularly changing which side it exposes to the sun. However, the gravitational pull that orbiting moons and planets experience slows the rate of their spin. The most stable arrangement they can reach is to keep just one side always facing the body they are orbiting. Such "tidal locking" is why our moon always keeps the same face pointed toward Earth. If the same were to happen with Earth and the sun, our planet would rotate once on its axis for every orbit it completed around the sun. In other words, an Earth day would be exactly as long as an Earth year, with one side receiving constant sunshine and the other experiencing perpetual night. Now, researchers suggest that Mercury was once tidally locked, initially spinning in the opposite direction to its orbit. "Mercury once had a spin rate synchronous with the sun, like the moon with the Earth," study co-author Alexandre Correia, a planetary scientist at the University of Aveiro in Portugal, told SPACE.com. Computer models suggest that a giant impact from an asteroid then knocked it into its current strange configuration. The space rock would have been at least 43 miles (70 kilometers) wide and 550 trillion metric tons in mass, or 1/600,000 the mass of Mercury, Correia said. Evidence of this collision might include Caloris Basin, Mercury's largest impact crater, which matches the predicted size, age and location of the impact, the researchers said. "It is the perfect candidate," Correia said. Such an impact might also explain certain hollows seen on Mercury's surface. This photo of a Mercury crater seen by NASA's Messenger spacecraft shows what appears to be a large pit in the center, possibly volcanic vent, from which the orange material erupted. Some odd hollows appear in cyan, a result of their high reflectance and bluish color relative to other parts of the planet. This image was released on Sept. 29, 2011. If the planet was tidally locked, one side would have been extremely bright and hot while the other extremely dark and cold. Substantial deposits of ice might have accumulated on the dark half, some of which might have been buried under matter ejected from impacts. When Mercury's spin later changed and daylight began falling on the once dark side, this buried ice might have vaporized, leaving behind hollows, the researchers explained. In addition, if Mercury was tidally locked, numerous other differences might be seen between the planet's former dark and light sides. For instance, the day-lit side would have been more viscous and thus flatter and more molten-looking, while the night side would have been more exposed to impacts and thus be more cratered. 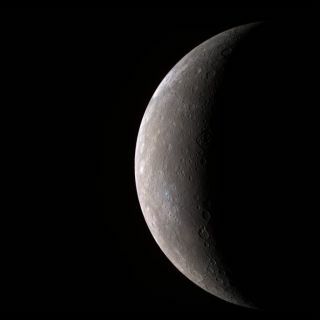 "The probe Messenger, presently in Mercury's orbit, can give further insight," Correia said. The results of the study were published online today (Dec. 11) in the journal Nature Geoscience.